Are you in the market for cut lengths? Are you afraid that your tubing is to small to be cut? Well, there is one method of cutting that provides clean cuts with no burrs for even small hypotubes. In addition, there are options for holes, slots, notches and other patterns! Are you asking yourself how? Well, consider EDM (Electrical Discharge Machining) or spark machining. A program is generated which drives a wire (or sinker electrode) along the designated tool path and erodes the material by electrical discharges that form an arc between an electrode tool and the work piece. 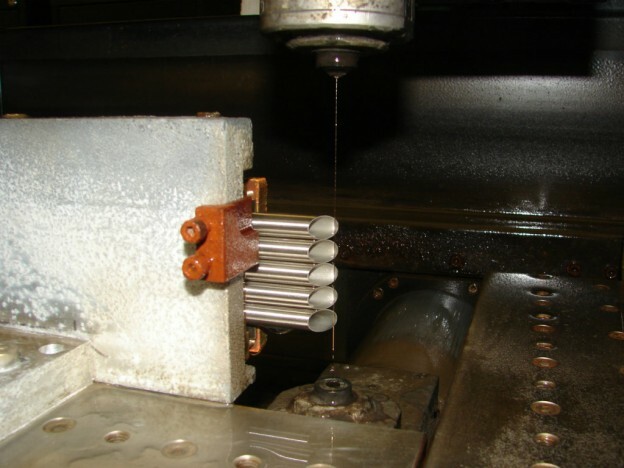 A positive aspect of EDM is that you can hold tighter tolerances relative to some other methods of cutting or material removal. For example, material with an OD smaller than the thickness of a human hair can be cut to +/-.003 on lengths less than .020. Material this small and short would be extremely difficult to cut using alternative approaches including electrochemical or abrasive. We use a proprietary technique to permit EDM cutting and deburring that many other companies would refuse to quote. Not just for cut and deburred products, we recently ran a job that involved cutting angled features on the INSIDE of an 18RW tube using a combination of wire and sinker EDM capabilities. The finished product revealed the awesome capabilities of EDM when applied correctly. As long as the material conducts electricity, it can be cut and deburred using Vita Needle’s EDM method—and fabricated into parts where appropriate for EDM These materials include stainless steel or any high nickel alloys, perfect for custom fabricating all types of tubing that Vita Needle sells! Please contact our sales department at Vita Needle for more information. Vita Needle company is also happy to review any prints that you are looking for fabricate.